HoudahGPS calls gpsbabel with the wrong parameters. It uses "-i dg-100" instead of "-i wbt". Thanks and bye - and merry xmas! I can confirm the bug. It will be fixed soon. It modifies the command line parameters. It replaces dg-100 with wbt. NOTE: HoudahGPS will now stop working for the GlobalSat DG-100/BT-335 GPS Devices. Thanks Arnulf/Bastian for posting this. As an alternative, I would suggest you give [URL=http://www.houdah.com/houdahGPS/download_assets/HoudahGPS%203.1b1.zip]HoudahGPS 3.1b1[/URL] a try. This is beta software: I just finished work on it this morning. It may still have some bugs. 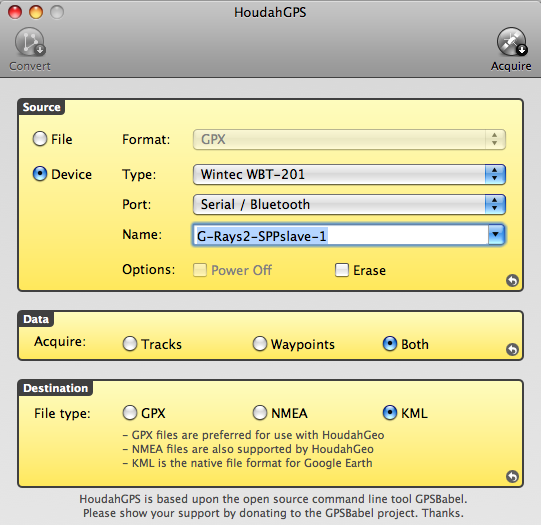 HoudahGPS 3.1 changes much of the internal structure of HoudahGPS. This does away with known bugs, but may temporarily have introduced new ones. The new structure will allow for faster upgrades as GPSBabel moves forward. Thanks for the new release - it does fix the bug and therefore works for me!